Minimalist running is currently making a big splash in the running world, and has been met with a significant amount of both positive and negative feedback. The minimalist running movement is about running in a more natural way, and stems from the belief that human feet are built to run, without the help of heavily-padded running shoes. Some people run completely barefoot, while many are turning to recently popularized minimalist footwear to offer their feet a small amount of protection without compromising their form, i.e. the shoes allow them to run as if they were barefoot. This post is the first in a series we plan to do detailing our transition into running in minimalist shoes. Meagan and I made our switch to the Vibram FiveFingers after only a little over a month of running in regular shoes, so our transition experience may be very different from someone who spent years running in regular shoes or someone who starts out running in minimalist footwear. In this, and future posts, we will talk about the progress we’ve made so far, the lessons we’ve learned (yes, we did some rule-breaking), and our goals as we continue on our minimalist-running adventure. Our decision to purchase Vibram FiveFingers was made on a whim, partly because we were curious what all of the fuss was about, and partly from our interest in continuing to try new things to keep ourselves motivated to run. 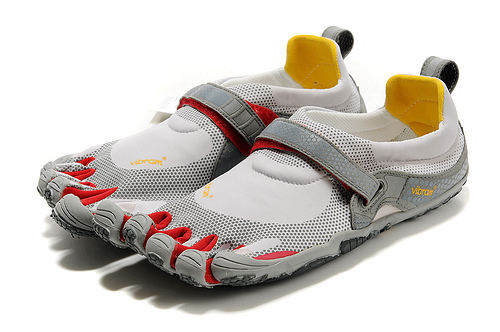 We had our first encounter with the Vibram FiveFingers at our local REI store one random Saturday afternoon. At the time, we had no intention of ever trying minimalist footwear. Who would ever want to wear crazy toe-shoes and look like a weirdo, right? So, we drove home, parked, and for some reason, it suddenly clicked with both of us that maybe we did want to try minimalist footwear; maybe this was our calling. We quickly went inside, put on our running gear, and drove to our local running shop, set on purchasing our first pair of Vibram FiveFingers. Meagan and I decided on the Bikila because it was listed as the “running” model. After putting our feet into the weirdest foot measuring thing ever, I landed on a size 45 (normally size 13 men’s) while Meagan fits in a size 42 (normally size 10 women’s). …in my FiveFingers, that is. I felt like it was the best run of my life. My feet were moving in a way they never had before, and I felt like I had a much higher amount of energy due to the new spring in my step. My second run not only felt amazing, but it helped me to obtain one of my fastest miles ever. I knew that from then on, minimalist running would drive me towards new goals and revitalize my interest in a hobby I gave up on during years past. Remember how I mentioned that doing our second run on our second day was a mistake? Yeah, stay tuned for a world of pain. Check back next week for our next Vibram Transition post, where Meagan will talk about a few of the more painful lessons we learned. Hint: Yes, you really should listen to the salesman when they tell you to take it slow! UPDATE: Chapter 2 is up!